Strategies to improve businesses, provide greater accessibility to community centers and honor longstanding culture are about to be further enhanced along the Interstate Corridor urban renewal area. Prosper Portland (formerly the Portland Development Commission) awarded eight Interstate-area projects with $300,000 total in community livability grants, the latest round offered to a series of districts, including Lents, Chinatown and the Central Eastside. "Community Livability Grants are one of our most valuable tools to help organizations fulfill neighborhood action plans and better serve diverse populations throughout the city," said Kimberly Branam, executive director of Prosper Portland. "We believe these successful proposals will support our goals to enhance partnerships and support thriving, vibrant neighborhoods in the North/Northeast community." Since 2006, Prosper Portland has awarded more than $5 million to 100-plus community livability projects across multiple urban renewal areas. "We have looked strategically. Looking back over the last 10 years with the recession, we've seen a huge uptick in growth in the city — when you pan out the numbers and factor in race as a determiner — there is a huge disparity in terms of wealth creation and access," Campbell said. "Part of our strategic plan is to be focused on all entrepreneurs in our city, particularly that people of color have the same opportunities to thrive and take advantage of growing the economy in our city." On the list of recipients are a micro-enterprise business campus, historical markers along Alberta Street and a space for the city's first African-American museum. "In an age where community involvement and partnerships are increasingly being recognized as indispensable, there is clearly a growing potential for cooperative development and revitalization efforts citywide," said Raymond Burrell of recipient Vancouver Avenue First Baptist Church. "Prosper Portland's valiant commitment to building healthy, vibrant and active communities recognizes that businesses, non-profit organizations, and civil society associations are vital resources that contribute to building a more robust global Portland community." "With MESO, this gives them the opportunity to … build out their campus," Tory Campbell told the Business Tribune. Campbell is Prosper's manager of entrepreneurship and community economic development, who oversees the work on the projects. "It optimizes MESO as a property owner now and supports their mission moving forward," Campbell said. "They have been an integral part of our small business partnership over the years. Let's give them a chance to be more rooted in the community and its efforts to help small businesses throughout the community." The organizations each have projects lined up, proposals that honor the neighborhood's culture and history, provide greater accessibility to community centers, improve business and marketing services for local micro-enterprises and increase community space. "MESO, that is their primary function, to help businesses throughout the city," Campbell said. "That particular grant really benefited right (toward) our mission in respects to creating more jobs as we have stronger, more viable jobs throughout the city." According to Prosper Portland, the grants will leverage more than $1.1 million in private investment and other funds along with hundreds of hours of volunteer labor in the Interstate Corridor. "We hope that these grants and their going to nonprofits that do amazing and necessary work speaks to the need of collaborative efforts to call all our citizens and organizations to make a better Portland for us," Campbell said. "We envision the dollars go out the door via grant doing that very kind of work contributing to very different muscles within our city — nonprofits and the work they do whether it's helping small businesses, a Baptist church, creating a museum that tells oftentimes the overlooked story of vibrancy within the African-American community." Campbell works with the committees to develop and commit to strategies that will create more economic growth. "That story adds complexity, necessary richness and flavor to our city," Campbell said. "Helping the Community Warehouse helps them provide necessary services as a bank. There's a lot of broad-reaching work in the city that's necessary for us all to pull together." The Community Livability Grant program funds projects with the priorities of improving access to jobs and workforce development services, support wealth creation opportunities for small business owners, honor and enhance the neighborhood's cultural diversity and history, and deliver an asset to the community tailored to its priorities and opportunities. Members of the North/Northeast Community Development Initiative Oversight Committee served on the grant evaluation committee, too. "These individuals who have volunteered to monitor the outcome of the North/Northeast action plan, a subcommittee of those folks sat on the selection panel for the community livability grant to ensure that the awardees aligned with the growth and objective of the North/Northeast plan," Kimberly Moreland told the Business Tribune. She's the senior project and program manager at Prosper Portland. Project applicants were evaluated on the context of their contribution to the North/Northeast plan, with an emphasis on building partnerships with community-based organizations driving economic development outcomes. It also took into account servicing communities that have experienced displacement or not benefiting from economic opportunities including African Americans, people of color and people with disabilities. "The main focus of the North/Northeast action plan is to include economic prosperity for African-Americans and people of color, so some of these candidates are long-term property owners," said Moreland. "Some of these organizations have been in their community for a very long time." The applicants who won the grant are required to make a good faith effort to contract their projects to certified minority-owned, women-owned, disadvantaged or emerging small businesses (MWDESBs), with help identifying potential firms from Prosper Portland. "The Billy Webb Elks Lodge received funding to support a major kitchen upgrade," Moreland said. "This will allow them to serve their community better and also to sustain themselves in a rapidly changing neighborhood — and it generates wealth for long-standing resources, so it's a part of our wealth creation goal." Some focus on physical improvements to increase access to existing opportunities. "Organizations like Friends of the Children and St. Andrew, who may have minor physical improvements, looking at ADA requirements for wheelchairs," Moreland said. "A simple wheelchair ramp is an improvement, but again they are long-standing organizations that will provide even better services for the disabled members of their community." Micro Enterprise Services of Oregon (MESO) will receive $75,000 to support a business, marketing and sales training center, the Child Care Improvement Project, and staff offices. Total project budget: $290,645. 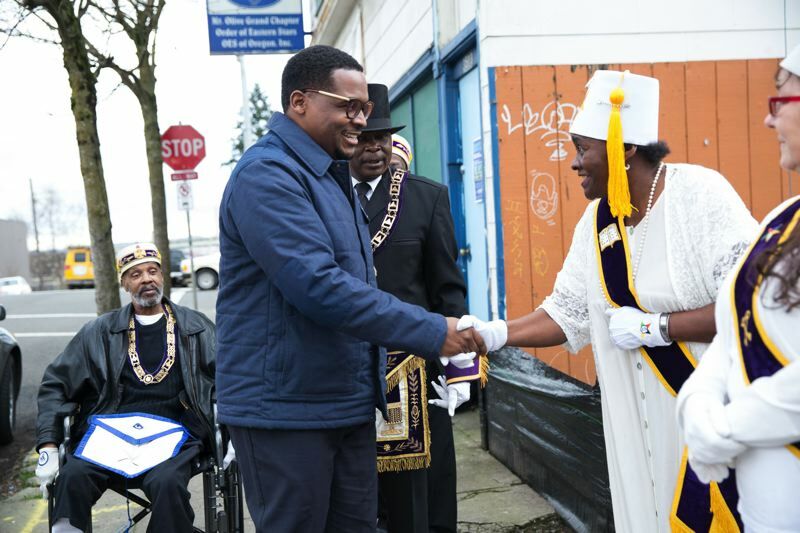 Vancouver Avenue First Baptist Church will receive $62,500 to increase building square footage from 6,000 to 10,000 square feet and expand non-religious programming to include space for Portland's first permanent African American museum. Total project budget: $262,200. Billy Webb Elks Lodge will receive $62,500 for external signage and a kitchen upgrade to accommodate events. Total project budget: $155,000. St. Andrew and All Souls Episcopal Church will receive $40,000 to improve ADA accessibility. Total project budget: $223,487. Friends of the Children — Portland will receive $25,000 for an ADA wheelchair lift to optimize both office and youth-dedicated programming spaces. Total project budget: $101,500. Alberta Main Street will receive $20,000 to support the design, creation, fabrication and installation of permanent, cultural/historical markers to honor the area's African American history and community. Total project budget: $53,235. Community Warehouse, Portland will receive $10,000 for store improvements. Total project budget: $60,000. Polish Library Building Association will receive $5,000 for exterior painting. Total project budget: $17,600.